New York, NY (August 7, 2018) – Bluerock Residential Growth REIT, Inc. (NYSE American: BRG) (“the Company”), an owner of highly amenitized multi-family apartment communities, announced today its financial results for the quarter ended June 30, 2018. 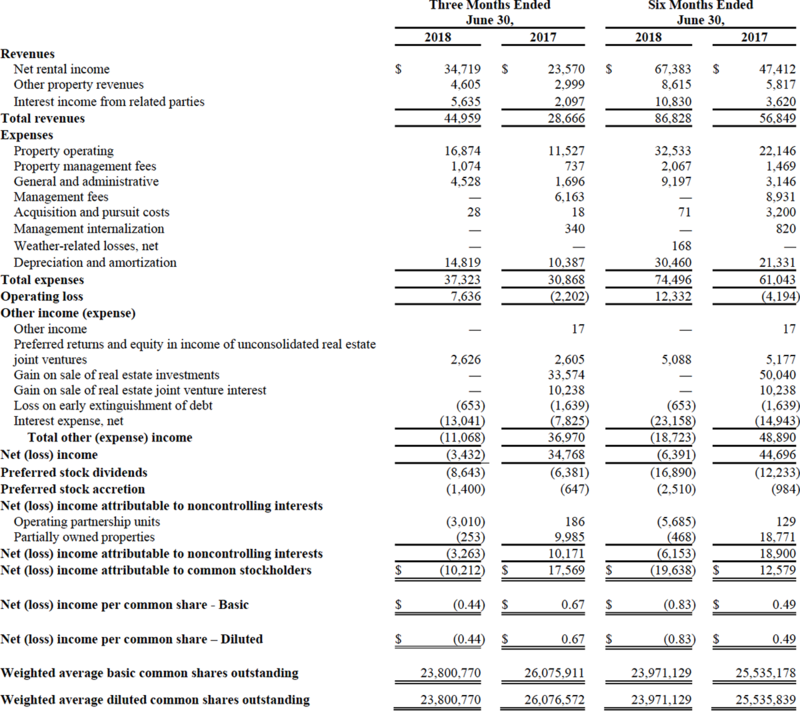 Total revenues grew 57% to $45.0 million for the quarter from $28.7 million in the prior year period. Net loss attributable to common stockholders for the second quarter of 2018 was ($0.44) per share, as compared to net income attributable to common stockholders of $0.67 per share in the prior year period. The prior year period included $1.26 per share of gains on the sale of real estate investments and joint venture interests. 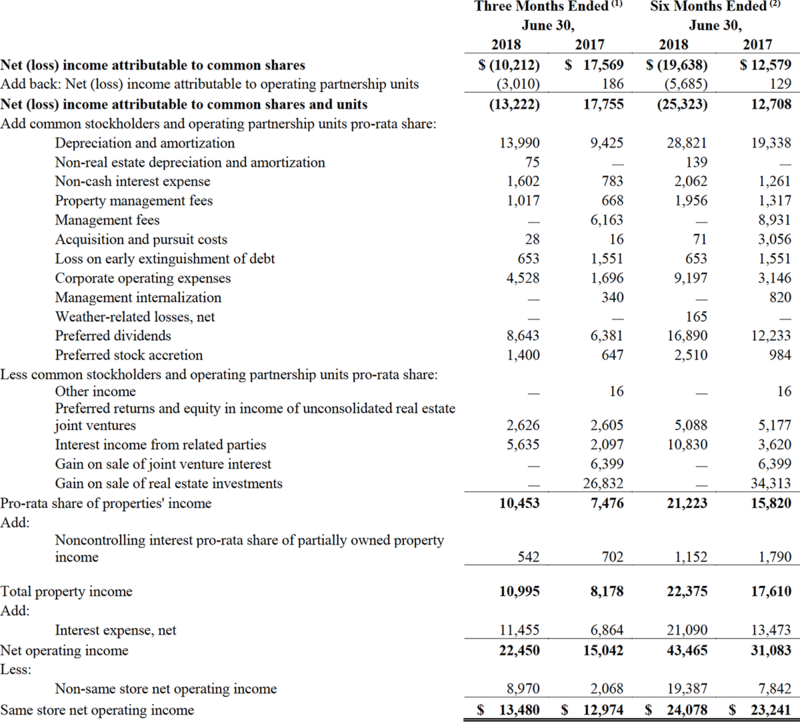 Property Net Operating Income (“NOI”) grew 49% to $22.5 million, from $15.0 million in the prior year period. Same store Revenue and NOI increased 3.6% and 3.9% respectively, as compared to the prior year period. Adjusted funds from operations attributable to common shares and units (“AFFO”) grew 56% to $5.3 million, from $3.4 million in the prior year period. AFFO per share is $0.17 for the quarter as compared to $0.13 in second quarter 2017. Consolidated real estate investments, at cost, increased approximately $151.5 million to $1.6 billion, from year end. The Company invested approximately $82 million in two multifamily communities totaling 502 units and $9 million to buy out minority ownership interests in two assets. The Company completed 292 value-add unit upgrades at an average cost of $4,708 per unit, and leased 269 of them during the second quarter. Year-to-date, the Company has completed 462 upgrades at an average cost of $4,373 per unit. The Company expects to complete between 900 and 1,200 unit renovations in 2018. Since inception, the Company has completed 942 value-add unit upgrades and achieved a $107 average monthly rental increase per unit, equating to a 27.4% ROI on all unit upgrades leased as of June 30, 2018. Repurchased 107,040 shares of stock during the second quarter at an average price of $8.96 per share, for a total cost of approximately $1.0 million. The Company increased the low end of its full year 2018 AFFO guidance from $0.65 to $0.66 per share and is affirming the top end of the range at $0.70 per share. Net loss attributable to common stockholders for the second quarter of 2018 was $10.2 million, compared to a net income of $17.6 million in the prior year period. The prior year period included approximately $32.8 million of gains on sale of real estate investments and joint venture interests. Net loss attributable to common stockholders included non-cash expenses of $14.2 million or $0.46 per share in the second quarter of 2018 compared to $17.1 million or $0.66 per share for the prior year period. AFFO for the second quarter of 2018 was $5.3 million, or $0.17 per diluted share, compared to $3.4 million, or $0.13 per diluted share in the prior year period. AFFO was primarily driven by growth in property NOI of $7.4 million and interest income of $3.5 million arising from significant investment activity. This was primarily offset by a year-over-year rise in interest expense of $4.4 million, general and administrative expenses of $2.0 million, and preferred stock dividends of $2.3 million. For the second quarter of 2018, property revenues increased by 48.0% compared to the same prior year period primarily attributable to the increased size of the portfolio. Total portfolio NOI was $22.5 million, an increase of $7.4 million, or 49.2%, compared to the same period in the prior year. Property NOI margins were 57.1% of revenue for the quarter, compared to 56.6% of revenue in the prior year quarter. Property operating expenses were up primarily due to the increased size of the portfolio. The Company’s same store portfolio for the quarter ended June 30, 2018 included 18 properties. For the second quarter of 2018, same store NOI was $13.5 million, an increase of $0.5 million, or 3.9%, compared to the same period in the prior year. Same store property revenues increased by 3.6% compared to the same prior year period, primarily attributable to a 4.2% increase in average rental rates, offset by average occupancy decreasing 50 basis points to 94.3%. In addition, the implementation of trash valet services at eleven properties and a general increase in resident fees increased revenues by $0.2 million. Same store expenses increased $0.3 million due implementation of trash valet services and the timing of seasonal maintenance. On April 26, 2018, invested approximately $9 million to increase our ownership stake to 100% in each of our ARIUM Gulfshore and ARIUM at Palmer Ranch properties. On May 1, 2018, acquired a 100% interest in a 264-unit apartment community located in Daytona Beach, Florida, known as Sands Parc. The total purchase price was approximately $46.2 million, funded in part by the Company’s Senior Credit Facility. On June 14, 2018, acquired an 80% indirect interest in a 238-unit apartment community located in Lake Jackson, Texas, known as Plantation Park. The total purchase price was approximately $35.6 million, funded in part by a $26.6 million mortgage loan secured by the Plantation Park property. During the second quarter, the Company raised gross proceeds of approximately $31.6 million through the issuance of 31,576 shares of Series B preferred stock with associated warrants at $1,000 per unit. 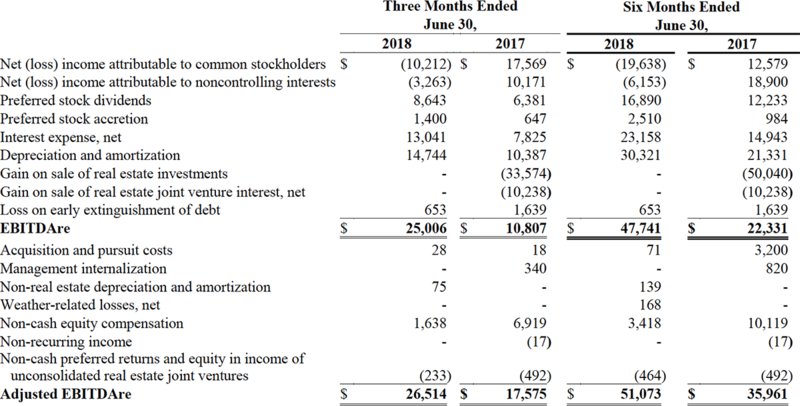 As of June 30, 2018, the Company had $25.4 million of unrestricted cash on its balance sheet, approximately $51.5 million available among its revolving credit facilities, and $1.1 billion of debt outstanding. The Board of Directors authorized, and the Company declared, a quarterly dividend for the second quarter of 2018 equal to a quarterly rate of $0.1625 per share on its Class A common stock, payable to the stockholders of record as of June 25, 2018, which was paid in cash on July 5, 2018. A portion of each dividend may constitute a return of capital for tax purposes. There is no assurance that we will continue to declare dividends or at this rate. On July 10, 2018, the Board of Directors authorized, and the Company declared, a monthly dividend of $5.00 per share of Series B preferred stock, payable to the stockholders of record as of July 25, 2018, which was paid in cash on August 3, 2018, and as of August 24, 2018, and September 25, 2018, which will be paid in cash on September 5, 2018 and October 5, 2018, respectively. Based on the Company’s current outlook and market conditions, the Company is increasing the bottom end of the 2018 AFFO guidance from $0.65 to $0.66 per share and is reaffirming the top end of the range at $0.70 per share. For additional guidance details, please see page 30 of Company’s Second Quarter 2018 Earnings Supplement available under Investor Relations on the Company’s website (www.bluerockresidential.com). Subsequent to issuing 2018 guidance in February 2018, the Company revised its presentation of AFFO attributable to common stockholders to reflect AFFO attributable to common shares and units. 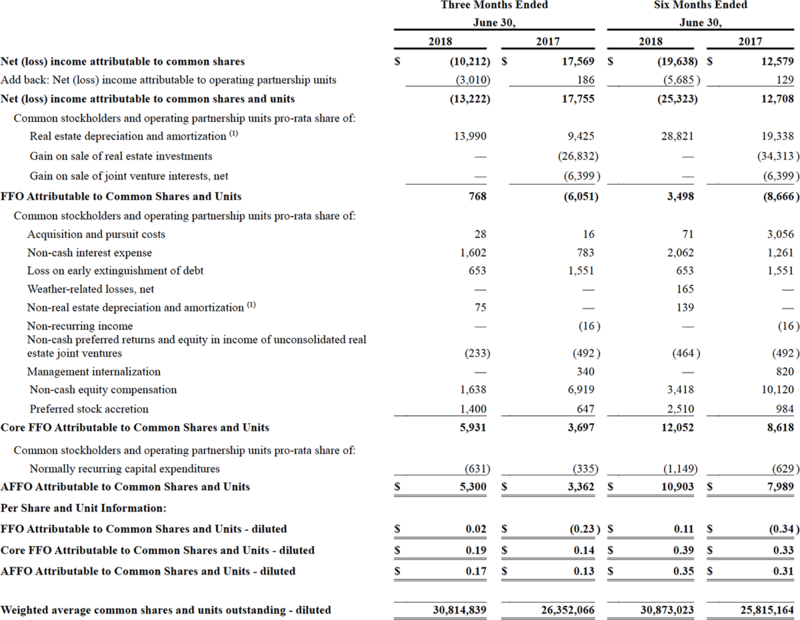 The estimated weighted average diluted shares and units outstanding used to calculate AFFO per share now includes noncontrolling interests – operating partnership units. As the Company’s presentation now also includes the impact of AFFO attributable to operating partnership units, and as shares and units are treated on a one-for-one basis, there is no change to projected AFFO per share for purposes of 2018 AFFO guidance. For those who are not available to listen to the live call, the conference call will be available for replay on the Company’s website two hours after the call concludes, and will remain available until September 7, 2018 at http://services.choruscall.com/links/brg180807.html, as well as by dialing +1 (877) 344-7529 in the U.S., or +1 (412) 317-0088 internationally, and requesting conference number 10122487. The full text of this Earnings Release and additional Supplemental Information is available in the Investor Relations section on the Company’s website at https://www.bluerockresidential.com. Bluerock Residential Growth REIT, Inc. (NYSE American: BRG) is a real estate investment trust that focuses on developing and acquiring a diversified portfolio of institutional-quality highly amenitized live/work/play apartment communities in demographically attractive knowledge economy growth markets to appeal to the renter by choice. The Company’s objective is to generate value through off-market/relationship-based transactions and, at the asset level, through value add improvements to properties and operations. The Company is included in the Russell 2000 and Russell 3000 Indexes. BRG has elected to be taxed as a real estate investment trust (REIT) for U.S. federal income tax purposes. This press release contains forward-looking statements within the meaning of the Private Securities Litigation Reform Act of 1995 and other federal securities laws. These forward-looking statements are based upon the Company’s present expectations, but these statements are not guaranteed to occur. Furthermore, the Company disclaims any obligation to publicly update or revise any forward-looking statement to reflect changes in underlying assumptions or factors, of new information, data or methods, future events or other changes. Investors should not place undue reliance upon forward-looking statements. For further discussion of the factors that could affect outcomes, please refer to the risk factors set forth in Item 1A of the Company’s Annual Report on Form 10-K filed by the Company with the U.S. Securities and Exchange Commission (“SEC”) on March 13, 2018, and subsequent filings by the Company with the SEC. We claim the safe harbor protection for forward looking statements contained in the Private Securities Litigation Reform Act of 1995. (1) Represents date of last significant renovation or year built if there were no renovations. (2)Represents the average effective monthly rent per occupied unit for the three months ended June 30, 2018. (3)Percent occupied is calculated as (i) the number of units occupied as of June 30, 2018, divided by (ii) total number of units, expressed as a percentage. (4)Alexan CityCentre, Alexan Southside Place, Helios, and Leigh House are preferred equity investments with an option to convert into partial ownership upon stabilization. 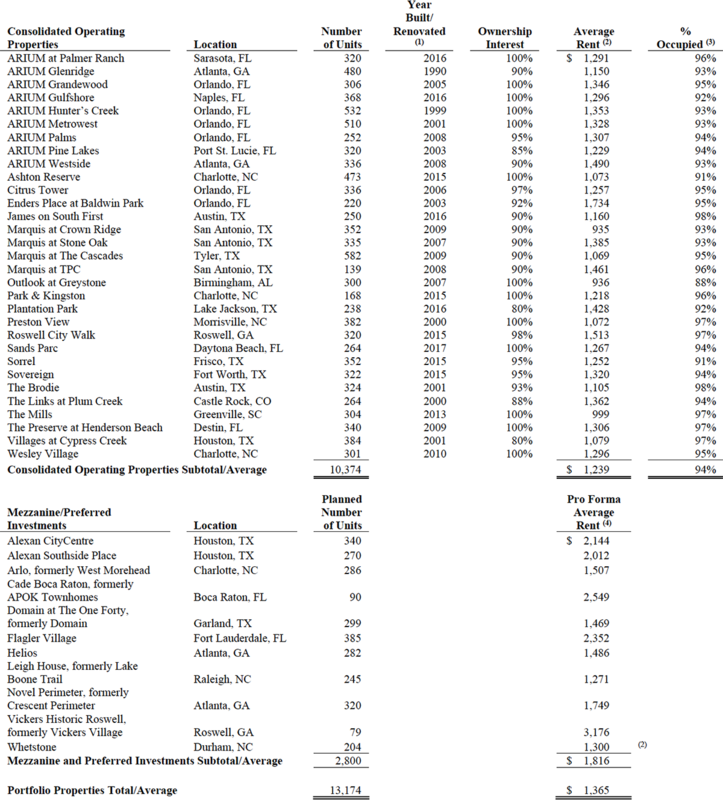 Cade Boca Raton, Novel Perimeter, Domain at The One Forty, Flagler Village, Vickers Historic Roswell, and Arlo are mezzanine loan investments. Additionally, Cade Boca Raton, Domain at The One Forty, and Arlo have an option to purchase an indirect property interest upon maturity. Whetstone is currently a preferred equity investment providing a stated investment return. Pro forma average rent represents the average pro forma effective monthly rent per occupied unit for all expected occupied units upon stabilization. The foregoing supplemental financial data includes certain non-GAAP financial measures that we believe are helpful in understanding our business and performance, as further described below. Our definition and calculation of these non-GAAP financial measures may differ from those of other REITs, and may, therefore, not be comparable. We believe that funds from operations (“FFO”), as defined by the National Association of Real Estate Investment Trusts (“NAREIT”), core funds from operations (“Core FFO”), and adjusted funds from operations (“AFFO”) are important non-GAAP supplemental measures of operating performance for a REIT. FFO attributable to common shares and units is a non-GAAP financial measure that is widely recognized as a measure of REIT operating performance. We consider FFO to be an appropriate supplemental measure of our operating performance as it is based on a net income analysis of property portfolio performance that excludes non-cash items such as depreciation. The historical accounting convention used for real estate assets requires straight-line depreciation of buildings and improvements, which implies that the value of real estate assets diminishes predictably over time. Since real estate values historically rise and fall with market conditions, presentations of operating results for a REIT, using historical accounting for depreciation, could be less informative. We define FFO, consistent with the NAREIT definition, as net income, computed in accordance with GAAP, excluding gains (or losses) from sales of property, plus depreciation and amortization of real estate assets, plus impairment write-downs of depreciable real estate, and after adjustments for unconsolidated partnerships and joint ventures. Adjustments for unconsolidated partnerships and joint ventures will be calculated to reflect FFO on the same basis. Core FFO makes certain adjustments to FFO, removing the effect of items that do not reflect ongoing property operations such as stock compensation expense, acquisition expenses, losses on early extinguishment of debt (includes prepayment penalties incurred and the write-off of unamortized deferred financing costs and fair market value adjustments of assumed debt), non-cash interest, one-time weather-related costs, and preferred stock accretion. We believe that Core FFO is helpful to investors as a supplemental performance measure because it excludes the effects of certain items which can create significant earnings volatility, but which do not directly relate to our core recurring property operations. As a result, we believe that Core FFO can help facilitate comparisons of operating performance between periods and provides a more meaningful predictor of future earnings potential. AFFO makes certain adjustments to Core FFO in order to arrive at a more refined measure of the operating performance of our portfolio. There is no industry standard definition of AFFO and practice is divergent across the industry. AFFO adjusts Core FFO for items that impact our ongoing operations, such as subtracting recurring capital expenditures (and while we were externally managed, when calculating the quarterly incentive fee paid to our former Manager only, we further adjusted FFO to include any realized gains or losses on our real estate investments). We believe that AFFO is helpful to investors as a meaningful supplemental indicator of our operational performance. Our calculation of Core FFO and AFFO differs from the methodology used for calculating Core FFO and AFFO by certain other REITs and, accordingly, our Core FFO and AFFO may not be comparable to Core FFO and AFFO reported by other REITs. 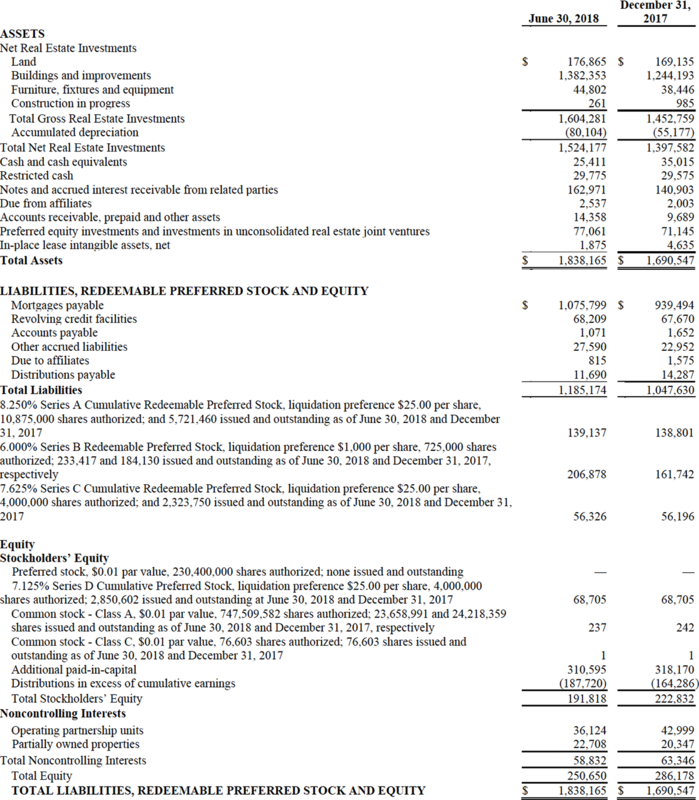 Our management utilizes FFO, Core FFO, and AFFO as measures of our operating performance after adjustment for certain non-cash items, such as depreciation and amortization expenses, and acquisition and pursuit costs that are required by GAAP to be expensed but may not necessarily be indicative of current operating performance and that may not accurately compare our operating performance between periods. Furthermore, although FFO, Core FFO, AFFO and other supplemental performance measures are defined in various ways throughout the REIT industry, we also believe that FFO, Core FFO, and AFFO may provide us and our stockholders with an additional useful measure to compare our financial performance to certain other REITs. While we were externally managed, we also used AFFO for purposes of determining the quarterly incentive fee paid to our former Manager in prior periods. Neither FFO, Core FFO, nor AFFO is equivalent to net income, including net income attributable to common stockholders, or cash generated from operating activities determined in accordance with GAAP. Furthermore, FFO, Core FFO, and AFFO do not represent amounts available for management’s discretionary use because of needed capital replacement or expansion, debt service obligations or other commitments or uncertainties. Neither FFO, Core FFO, nor AFFO should be considered as an alternative to net income, including net income attributable to common stockholders, as an indicator of our operating performance or as an alternative to cash flow from operating activities as a measure of our liquidity. We have acquired interests in nine additional operating properties subsequent to June 30, 2017. Therefore, the results presented in the table below are not directly comparable and should not be considered an indication of our future operating performance. (1) The real estate depreciation and amortization amount includes our share of consolidated real estate-related depreciation and amortization of intangibles, less amounts attributable to noncontrolling interests – partially owned properties, and our similar estimated share of unconsolidated depreciation and amortization, which is included in earnings of our unconsolidated real estate joint venture investments. NAREIT defines earnings before interest, taxes, depreciation and amortization for real estate (“EBITDAre”) (September 2017 White Paper) as net income, computed in accordance with GAAP, before interest expense, income taxes, depreciation and amortization expense, and further adjusted for gains and losses from sales of depreciated operating properties, and impairment write-downs of depreciated operating properties. We consider EBITDAre to be an appropriate supplemental measure of our performance because it eliminates depreciation, income taxes, interest and non-recurring items, which permits investors to view income from operations unobscured by non-cash items such as depreciation, amortization, the cost of debt or non-recurring items. Adjusted EBITDAre represents EBITDAre further adjusted for non-comparable items and it is not intended to be a measure of free cash flow for our management’s discretionary use, as it does not consider certain cash requirements such as income tax payments, debt service requirements, capital expenditures and other fixed charges. EBITDAre and Adjusted EBITDAre are not recognized measurements under GAAP. Because not all companies use identical calculations, our presentation of EBITDAre and Adjusted EBITDAre may not be comparable to similarly titled measures of other companies. Below is a reconciliation of net loss attributable to common stockholders to EBITDAre (unaudited and dollars in thousands). We define recurring capital expenditures as expenditures that are incurred at every property and exclude development, investment, revenue enhancing and non-recurring capital expenditures. We define non-recurring capital expenditures as expenditures for significant projects that upgrade units or common areas and projects that are revenue enhancing. Same store properties are conventional multifamily residential apartments which were owned and operational for the entire periods presented, including each comparative period. We believe that net operating income, or NOI, is a useful measure of our operating performance. We define NOI as total property revenues less total property operating expenses, excluding depreciation and amortization and interest. Other REITs may use different methodologies for calculating NOI, and accordingly, our NOI may not be comparable to other REITs. We believe that this measure provides an operating perspective not immediately apparent from GAAP operating income or net income. We use NOI to evaluate our performance on a same store and non-same store basis; NOI measures the core operations of property performance by excluding corporate level expenses and other items not related to property operating performance and captures trends in rental housing and property operating expenses. However, NOI should only be used as a supplemental measure of our financial performance. Certain amounts in prior periods, related to tenant reimbursements for utility expenses amounting to $1.5 million and $3.0 million for the three and six months ended June 30, 2017, have been reclassified to other property revenues from property operating expenses, to conform to the current period. In addition, property management fees have been reclassified from property operating expenses. (1) Same Store sales for the three months ended June 30, 2018 related to the following properties: Enders Place at Baldwin Park, ARIUM Grandewood, Park & Kingston, Ashton Reserve, ARIUM Palms, Sorrel, Sovereign, ARIUM Gulfshore, ARIUM at Palmer Ranch, The Preserve at Henderson Beach, ARIUM Westside, ARIUM Pine Lakes, James on South First, ARIUM Glenridge, Roswell City Walk, The Brodie, Preston View and Wesley Village. (2) Same Store sales for the six months ended June 30, 2018 related to the following properties: Enders Place at Baldwin Park, ARIUM Grandewood, Park & Kingston, Ashton Reserve, ARIUM Palms, Sorrel, Sovereign, ARIUM Gulfshore, ARIUM at Palmer Ranch, The Preserve at Henderson Beach, ARIUM Westside, ARIUM Pine Lakes, James on South First, ARIUM Glenridge, Roswell City Walk and The Brodie.